Chloe Grace Moretz showcased her eclectic style while promoting her new movie, “Brain on Fire,” during the 2016 Toronto International Film Festival. On Friday, the 19-year-old actress attended a press conference for her biographical drama film held at TIFF Bell Lightbox. She opted for a rather casual look, wearing a black Wolford bodysuit (available at Net-A-Porter) and a pair of black Rag & Bone jeans. Chloe kept her accessories simple, allowing her toned physique to do the talking. A black choker added drama to the look, while a pair of red pumps brought a pop of color to the all-black ensemble. She wore her blonde locks in side-parted waves, and completed the look with neutral makeup. Chloe slipped into a pair of Gianvito Rossi “Carla” pumps. These red suede pumps have wraparound ankle tie fastenings, low-cut vamps, almond toes and about 4.3-inch heels. 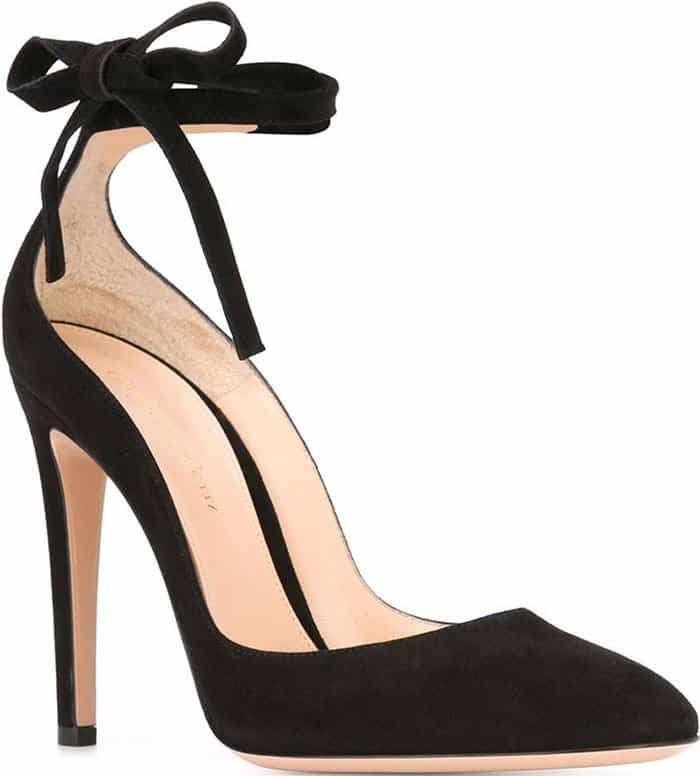 Check out these pumps in black at Farfetch. Later that same day, Chloe graced the red carpet premiere of her latest film held at Princess of Wales Theatre. She ditched her casual ensemble in favor of a glamorous Miu Miu gown and looked the epitome of style and glamour. She showcased plenty of flesh in the sunshine yellow halter dress, which featured floral prints and a bejeweled plunging neckline that almost hit her navel. Letting the dress take center stage, Chloe wore minimal accessories and pulled her hair back into a loose ponytail. Her red lipstick, pink blush and subtle smoky eye-makeup completed her sensational look. Chloe teetered on a pair of light blue satin sandals. They have crisscross front straps, adjustable ankle straps, about 0.5-inch platforms and 5.5-inch towering stiletto heels. Can you help us identify her sandals?